Age of Wonders III was released at the end of last month by Dutch developer Triumph Studios. Please allow me to share my thoughts about it with you. Let me start right now by stating that I really enjoy Civilization V. The Heroes of Might and Magic series isn’t bad either. All of this being said, I have NEVER finished a game of either of these two games. Despite almost 300 hours of game play on Civ 5 and countless games of various iterations of Heroes of Might and Magic I have NEVER finished a game of either. I’ve been right on the ragged edge of finishing both games, but just never quite got there. I always get bored by that point. So why am I mentioning all of this in a review of Age of Wonders III? Because Age of Wonders III is the love child of the afore mentioned games. When my friend David suggested I take a look at AoW 3 my initial assessment was that it looked like a Heroes of Might and Magic clone. And though I have played various incarnations of the franchise many times, I’ve never been a big fan. The concept is a great one in my opinion, but it always felt too simplistic to me. Because of this, I almost dismissed AoW 3 completely. Luckily I didn’t. 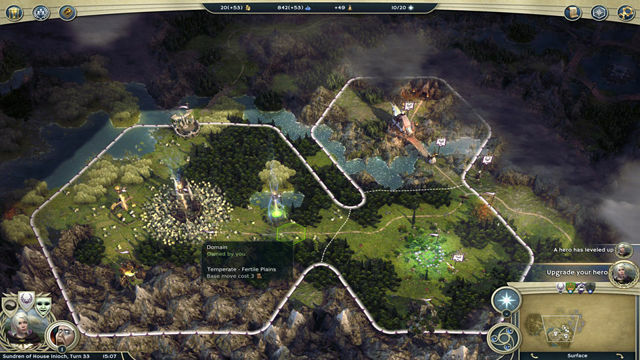 As I said before AoW 3 is very much a combination of Civ 5 and Heroes of Might and Magic. However, it is much better that. The feature that really stands out to me is the tactical combat. Your leaders and heroes spells really feel like they influence the battles a great deal. Whether it be a simple one off damage spell, a damage spell that targets or jumps to multiple targets, a buff or debuff spell, or a battlefield wide spell. They all seem to bring more to the battle than one would imagine. One spell I managed to research called Chaos Rift caused random creatures to spawn on the side of my army every turn while doing damage to the enemy’s units at the beginning of my turns. Also, things like attacks of opportunity, flanking, and first strike make the tactical combat way more deep than any Heroes game I’ve ever played. While the strategic map looks a lot like a Heroes game as well, the city building, research, and economy feel more like a Civ 5 game. There are many buildings that effect your economy and your military. The trick is figuring out what to build and when. This has a profound effect on your strategy. For instance, concentrate on all of your military buildings first and you may not have the resources to keep your armies paid or sufficient power to cast spells. One of the coolest buildings you can build is a structure that allows you to create magic items for your leader or heroes. This is especially helpful if you haven’t found much loot in your travels or battles. The spell system in the game is enjoyable if a bit confusing at times. A big part of the game is researching spells for your spell book. There are spells that target individual units, all the way up to effecting a city or your entire domain. The problem is I haven’t found a way to figure out which research leads to another. I’ve played two separate games with the exact same character and not had the exact same suite spells available to me for whatever reason. It can be a bit confusing, but totally worth it when you can research a spell that causes damage to enemy armies that are in your territory every turn or drops the morale of an enemy city by 300 points. The last thing I want to touch on is the character creation. You can use pre-generated leaders to play or you can create a custom one. It’s mostly a cosmetic thing, but you can choose which schools of magic your leader starts with which is great as it allows experimentation of play styles. I think Triumph Studios deserves kudos for giving players this option as you wouldn’t necessarily see it in this genre of game. Anytime we as players are given more options it should be applauded. My bottom line on Age of Wonders III is pick this up if you like turn based strategy, especially if you’re a fan of Civ 5 or Heroes of Might and Magic. You won’t be disappointed. Lastly, I finished my first game of Aow 3 last weekend and have started another. Let’s just say I didn’t get bored. As much as I'm a fan of Age of Wonders, I refused to buy the new game as the developer is absolutely REAMING gamers outside the US with ridiculous prices for a digital download. In some countries, gamers are paying almost twice what American gamers would pay for the same game so, no, as long as developers like t his keep scamming non-American gamers, I won't be buying their games. Sad. Wow. I had no idea! I am curious what the justification for this practice is, especially with digital downloads. I can understand a slightly higher fee for disk copies of a game that have to be shipped out of the country but it seems like there shouldn't be more cost for a digital download. Odd and yes, sad. The devs are based in Europe, why should they "scam" their own region.